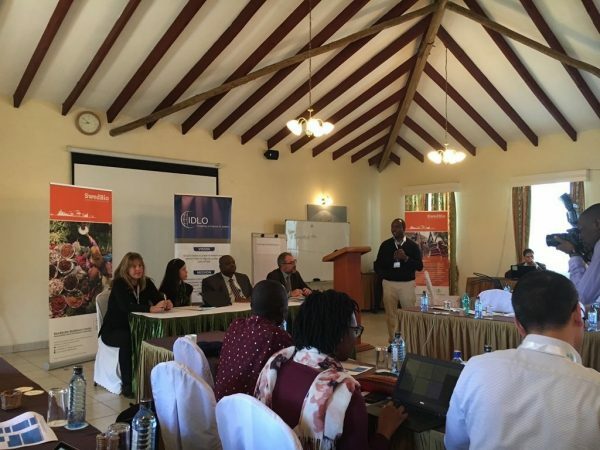 The peer-to-peer dialogue took place between 28th and 31st May 2018 at the Maanzoni, Lodge on the outskirts of Nairobi, Kenya. The dialogue, co-organised by ICCA Consortium partner SwedBio, Member Natural Justice, the International Development Law Organization, Office of the United Nations High Commissioner for Human Rights-Special Procedures and UN Environment, brought together practitioners of environmental and human rights law from the judiciary, academia, civil society and various levels of government. The diverse group was from Africa, the Americas, Asia and Europe. During the forum, preselected groups of participants with complementary expertise and backgrounds read and discussed a variety of literature and made recommendations for goals to be set for the post 2020 global biodiversity framework and contribute to the implementation of the human right to a healthy and sustainable environment. In the “world cafes”, topics ranged from human rights, environmental impact assessments and the CBD, legal empowerment and women’s rights, and biodiversity. On 30th May 2018, participants visited the Nairobi National Park and considered together how to reconcile wildlife and land use choices in this peri-urban national park. Encroachment into the park by the city of Nairobi was evident, and discussions revolved around the importance of biodiversity conservation and sustainable use in the face of massive infrastructural developments. The park wardens highlighted the innovations the Kenya Wildlife Service is trying to implement in the face of significant infrastructural development and privatisation of land. The workshop provided the practitioners with an excellent opportunity to share their unique experiences as they considered recommendations for a human rights-based target to be woven into the post 2020 global biodiversity framework. It was an opportunity to reflect on the global advancements in environmental law, and how these could be combined with country-wide efforts that would be rooted in local realities.